Since the box office success of YA sagas like Harry Potter and Twilight, movie studios seem to have been engaged in their own type of hunger game; specifically, one of Hungry Hungry Hippos. Read through any book rag and you'll learn that a new 'not yet published' young adult series has been snapped up by a production company practically sight unseen. Quite often, these optioned works seem to disappear into the ether, dropped when they don't hit the bestseller list. When they make it through, however, they're often rushed, over-simplified, cast with a motley crew scraped up from the bottom of the barrel, and released in a state of dire disrepair. If you've read Suzanne Collins' Hunger Games series, you know they were practically begging for a film adaptation. Collins has a strong story, but a fast and loose prose style. The novels, as we breeze through them, are the meaty bones of a filled-in screenplay. 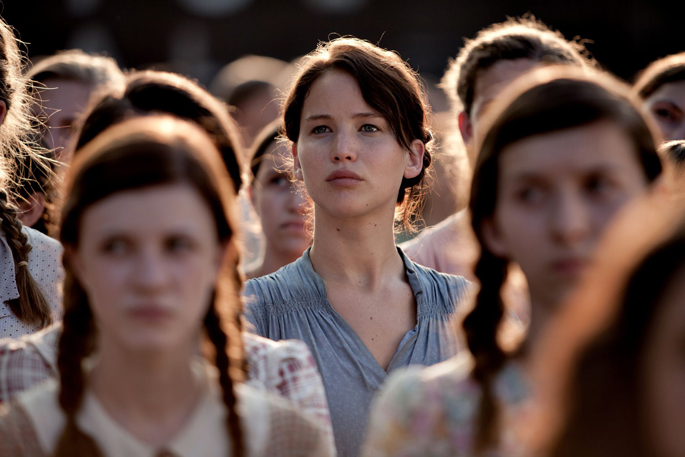 Collins doesn't excel at imagery, Katniss's first-person narration veers, at times, on clinical, yet, what she is able to do within the novels (the first in particular) is introduce us to a scenario that's frightening, to sustain a constant action, and to fill in just enough for us to be able to rebuild the world. 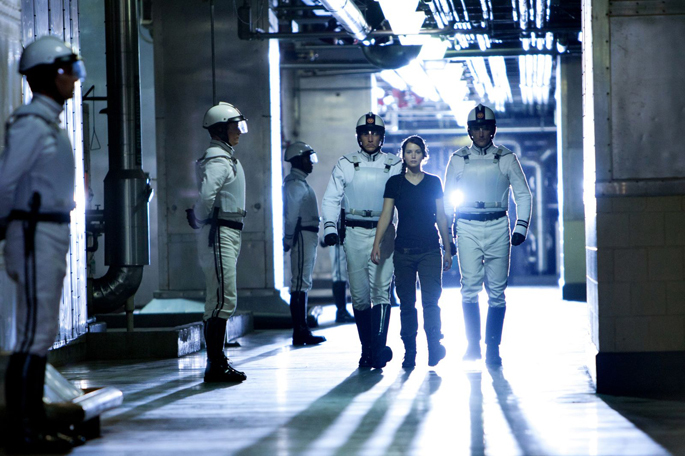 Everything is on the page, and the odds were very much in director Gary Ross's favour. To mess this up, frankly, you'd have to be an idiot. For those unfamiliar with the world of Panem, The Hunger Games is a dystopian vision of a future America. In the wake of a uprising and civil war, generations have become uncomfortably numb in their fractured, fixed position within a broken-up country. Contemporary Panem is a controlled state under military rule, and one of the ways they keep it that way is via the Hunger Games, a televised national event in which a boy and girl from each of the nation's twelve 'districts' is drafted, pushed into an arena, and forced to kill or be killed. 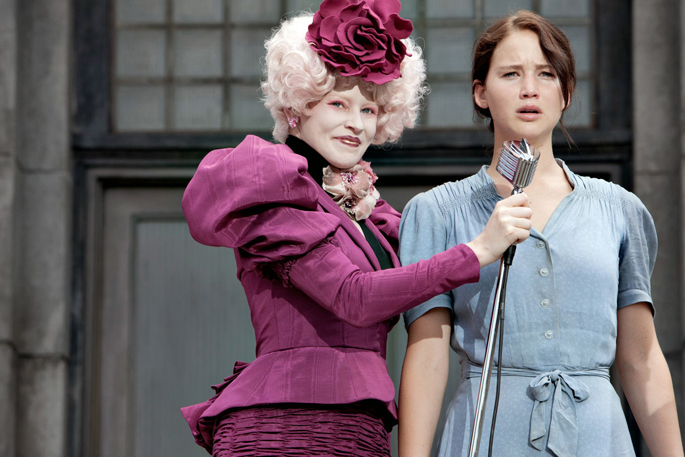 In the Hunger Games, 12-year olds must battle 18-year olds, and vice versa. Children mercilessly stab one another, smash each other's faces in with bricks, impale one another, and the world watches for days on end, riveted, glued to the screen as jovial announcers offer a play-by-play. The last one standing wins honor, riches, and a lifetime of post-traumatic stress. This nightmare has played out for 74-years, leaving a trail of destroyed families in its wake. Where I'd argue that the book itself was more entertaining than depressing, the framework was always there and the camera manages to engage with the book's deep emotional implications. While Ross doesn't skimp on the violence, he doesn't relish it. The Hunger Games isn't the gleefully gladiatorial Battle Royale (though, if you've only seen the sloppy film...might I suggest the book?). The fight to the death has been re-framed not as exploitation, but as pure, harrowing tragedy. In early moments, as our heroine Katniss Everdeen (Jennifer Lawrence) volunteers to step into the line of fire in exchange for her fragile sister's life, the scene is played for a frightening amount of realism. The stark costuming and gray faces echo images of prisoners of war, of death camps and political strife. We can see why Jennifer Lawrence was cast. District 12 is the same down-and-out Appalachia as Winter's Bone, though its inhabitants don't have the luxury of escaping via chemical, drugged-up outlets. Katniss is protective of her people, willing to put herself in harms way, and Lawrence has a face like a mountain lion. We read her in every tensed up muscle, and while the screenplay keeps her lines to a minimum, she's more powerful when silent. Lawrence does a tremendous amount of work here, and we can forgive her some of the more wooden, action-movie lines she doles out. As with the novels, we stay with Katniss nearly every step of the way. The character could have easily become tiring in the hands of a lesser actress, and in the first half of the film we may have been forced to wonder if we'll ever reach the bloodbath. While for my money the film is a beautifully paced work of science-fiction that creates something worthy of a bit of hype, it certainly has its fair share of flaws. The Monday after The Hunger Games weekend I sat down to lunch with a co-worker who hadn't read the book. She admitted that she didn't enjoy the movie and, what's more, was thoroughly confused by several events and interactions she interpreted as fairly hypocritical behaviors. As I listened to her I realized that quite a few of her points were valid. In an attempt, perhaps, at being universal and at pulling focus to the games themselves, the film fails to fill in some crucial spaces that could have added to its cause. Maybe we needed some more time in District 12, further understanding as to how much of what Katniss was doing was illegal, a deeper knowledge of Haymitch's (Woody Harrleson) backstory, or, more of a context for how complicated the background love triangle between Katniss, fellow competitor Peeta (Josh Hutcherson), and at home bestie Gale (Liam Hemsworth) really is. If you haven't read the book, the movie glosses over quite a bit, and while that's always the case in adaptation, here the cut-out pieces seem, potentially, to also limit enthusiasm for the film to its built-in fan base. As a popcorn blockbuster, The Hunger Games succeeds. As a movie made for fans, it excels. The question, however, is how far can it reach? When does the detail lost in the transition from book to film become enough to alienate a new viewer? As the story shifts into its more political sequels, will the casual fan, the new viewer stay on board?